Heads up – there's an intro! Read it first, then come back here and read through 1 Samuel, chapter 1. "I am a woman who is deeply troubled. At the very beginning of this incredible story, we meet a woman whose name is Hannah. Hannah is married to Elkenah (we'll call him E), a man of God who goes to the temple in Shiloh each year to offer sacrifices to the Lord. E has a second wife as well – Peninnah – which wasn't a very common practice during this time. When we read that Hannah is childless, it starts making sense why E might have another wife. 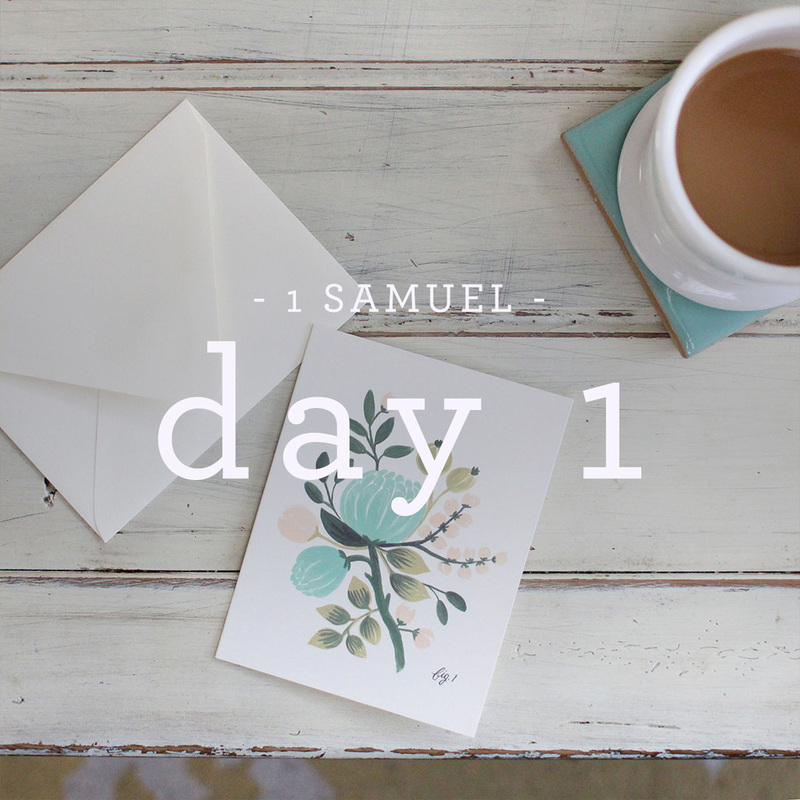 1 Samuel tells us twice in this chapter that "the Lord had closed her womb"... and when Scripture repeats anything, we know it's because it's worth repeating. Something's going on here. Hannah's childlessness is no accident – it was intentional and for a purpose. We also read that E offers a double portion of the sacrifice in Hannah's name... and not because he was asking God to give her children necessarily. It says right there in the Scripture that E did this because "he loved her." Oh, my heart. Man of God loves his wife. Simple. As. That. Peninnah wasn't the greatest second wife... in fact, she was downright mean. Each year that they went to the temple, she would taunt Hannah about her childlessness. Talk about harsh. But even though she knew Peninnah was going to deliver as many insults as she could come up with, Hannah continued journeying to the temple each year with her family. Like her husband, Hannah was faithful to God. Hannah then got up and began to pray. As she prayed, she began to weep... she was praying out loud, but no sound came out of her mouth because of her tears (ever been there before?). Eli, the temple priest, approached her and thought she was drunk! When he told her to "put away [her] wine", she responded: "I am a woman who is deeply troubled. I have not been drinking wine or beer; I was pouring out my soul to the Lord. Do not take your servant for a wicked woman; I have been praying here out of my great anguish and grief." (v.15-16). Do you ever question if what you're wanting in life is selfish... so you choose not to pray about it? Maybe more than anything, you'd really like that dream job. Or to get married. Or to be able to go on that big trip across Europe. Or to have different friends. Or to be the next fill-in-the-blank-person-you-admire. You remain frustrated that whatever it is hasn't happened for you yet, or become jealous because someone else is living your dream. And you don't bring it to God because you know in your heart that you should feel differently. Hannah was completely unafraid to bring her troubles to the Lord. She wanted a child so badly, and she let Him know. She laid it all out on the table for Him. And in the midst of doing so, she made a vow: "Lord Almighty, if you will only look on your servant’s misery and remember me, and not forget your servant but give her a son, then I will give him to the Lord for all the days of his life, and no razor will ever be used on his head." Eli saw her troubles and asked her what was going on. After she explained, he gave her a blessing, praying that the Lord would grant her what she had asked of Him. Sometimes these things we want... we lay them out on the table to God, but we fear He didn't hear us. Especially as time passes, we began to wonder why we even prayed, why we even asked, when we knew He wouldn't deliver. Thankfully, God built us for community, and so often He uses the people in our lives to speak to us. Often we need to share the burden of our request with those close to us, and ask them to pray on our behalf. Just hearing a friend's reminder and encouragement: "Our God is so good. Let's pray together that He would answer your prayer." We are made to do this life together. And we see proof of that in Hannah after hearing Eli's blessing. She rises early the next morning with her family, and worships the Lord. No promise that she would receive what she's asked for. But she's laid it before God, done her best to give it to Him and to trust in His providence. She rises and she worships her God, who gives good gifts. Then they go back home. We could stop here and be done. Yes, Lord. You are good and we are learning, day by day, to trust you more. But you know what's even better? God answered her prayers. Shortly after returning home, Hannah became with child (yes!!!) and gave birth to a son. She named him Samuel, and once he was weaned, she took him with her on their annual trip to the temple. Eli, old as he was, was still there and she told him that this was the son she had prayed for. I'm jumping up and down over here, y'all. God is so good!!!! Then... she leaves Samuel there, with Eli. She gave him over to the Lord, to live and worship in the temple. No promise that that wouldn't be her only child. She humbly gives her gift to the Lord, to bring Him much glory. Gosh... imagine if we did that? With our houses... if we made them a sanctuary for people to seek refuge? With our friendships... if we let God be the leader of the relationship and found new ways to let others in, too? With our talents... if we let God show us how to use them to praise His name? Hannah went home and had five more children. Her gifts from the Lord were multiplied. There's a popular song on the radio right now called Multiply and the lyrics say, "God of mercy, sweet love of mine... I have surrendered to your design. May this offering stretch across the sky and these hallelujahs be multiplied." When we give our requests to the Lord... he hears our cries with compassion. He answers our prayers in his own perfect time. He gives us strength and peace when we worship Him and when we share truth with our brothers and sisters. And in all of this, even if our prayers aren't answered the way we were expecting (and that happens often), He gives us a legacy of faith... a legacy that brings us joy and purpose, and that makes much of Him.